These are my freshly baked choc chip muffins. They were simple enough to make plus they taste very yummy indeed! The ingredients are; 1 cup of butter, 1 and a half cups of self- raising flour, 1 teaspoon of vanilla essence, 3 eggs, 1 cup of sugar, 50g of choc chips, half a cup of milk. Preheat the oven to 160 degrees. Line up a 12-cupcake pan with cupcake papers. In a medium -sized bowl, lightly beat the eggs, add butter, sugar, then mix until light and fluffy. Add milk, flour, vanilla, and choc chips, and stir to combine. Beat with an electric mixer for 2 minutes until light and creamy. 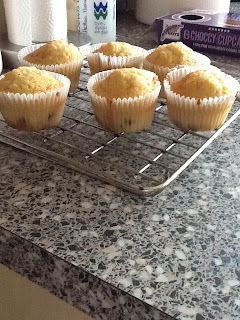 Divide the mixture evenly between the cupcake papers. Bake for 18-20 minutes until risen and firm to touch. Allow to cool for a few minutes and then transfer to a wire rack. Excellent first post. Look forward to seeing more recipes.